Knights were riders and the horse plays a dominant part in their history. Around the middle of the second millennium B.C., the Hittites and related peoples of the Near East were among the first to use them for tactical purposes. After the second great migration of nations in the 12th century B.C. the horse was harnessed to the war chariot and emerged as the animal ridden by warriors. At the height of the Middle Ages it was covered with a trapper bearing the owner's heraldic emblems. As protection the horse was eventually to receive plate armour and the iron-faced saddle that belongs to it. 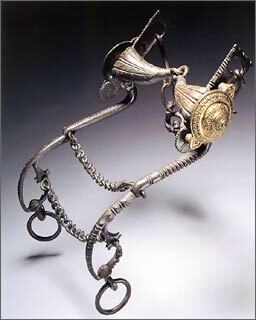 Frequently, however, the iron chanfron alone was considered sufficient protection for the charger and may be seen as the equivalent of man's helmet. 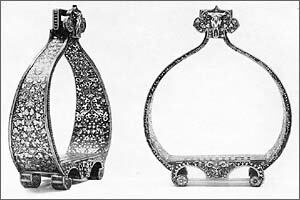 But a snaffle-bit--or in the case of the unruly charger a curb-bit, which acts as a lever on the horse's mouth-stirrups and spurs always formed part of equestrian equipment. Riding equipment was not counted among the arms but was kept near them in the armouries which, significantly, were in the care of the master of the horse. This provides evidence of the great importance that the ruling class attached to the horse in their court life. The books on horses that were so widely read by the aristocracy dealt with their breeding and illnesses and with breaking and training according to the principles of the Spanish riding school. Other, more specialized "Bit-books" contained accurate illustrations of many different kinds of bits for every conceivable purpose and temperament. A curb-bit and a pair of stirrups, remnants of an extremely rich set of riding equipment, have been preserved in Vienna. (The spurs that belonged to it were probably attached to the sabatons of the armour and lost with it.) The material is cast bronze and the outside is ornamented with legendary figures cast and chased in relief, whilst the inside is covered with etched ribbons. The entire surface is heavily gilded, with the exception of the tongue-piece of highly polished steel. To judge by the decoration, the work must have been done in Augsburg. These parts are obviously remnants of the garniture to which the similarly decorated helmet in the Wallace Collection (A 188) belonged. This also provides us with the name of its owner and the date of its creation--Maximilian II, then King of Bohemia, owner of the blue and gold and the closely fluted garnitures which were completed by the third golden one. One can imagine the brilliant impression created by this golden garniture, consisting of chanfron, saddle and the bridle illustrated here. The profusion of its endless ribbon pattern and the mass of decorative motives is confined within elegantly drawn contours that are at once gentle and severe. Great stuff Nathan! More into my line of toys now, BTW. That bit is pretty darned nifty, and while it looks cruel, is actually designed so that you need VERY little pressure on the reins to transfer information to the horse. With all of the geegaws on the port (I hesitate to say "Crickets" since there are so many of them there!) are to give a nervous horse something to focus on, and occupy him rather than the other more onerous "Bogards" that are out there to distract him (interesting that in the 17th Century such spooky things were called "Bogards" while today they are "Boogers"... nice bit of continuity). Keeps his mouth nice and wet too, which is a plus. Nice to see a shot of the top of the stirrups too. I had imagined that they MUST be constructed in this way, but nice to have the evidence. There are some very nice illustrations of similar horse gear in "Weapons and Warfare, 1618-1648" by Eduard Wagner, so it's good to see pictures of the originals. One really interesting thing though, there is a bit VERY much like the one shown, though without the outlandish ornamentation or crickets, made by the famous Western spurrier Garcia Bit and Spur of Elko, Nevada. A friend has one, and it's on my want-list! Blued steel and silver mounted... OY! I posted this one specifically for you, Gordon. I know it's a lot more ornate than most would be interested in replicating, but the form and function of the piece conveys volumes nonetheless. Then thank you VERY much for this treat! I am most appreciative of it. I really enjoy researching and then replicating things, so this is a great aid to my endeavours! Nathan; Thank you yet again! What is really neat is that I've just finished reading a 1625 work on horsemanship by Gervase Markham (who wrote on all sorts of diverse subjects) which of course delves into bits and stirrups. Something quite different from today's usage is the broad port-piece used on the curb bit, but well illustrated in Markham, and also the fact that it is "broken" in the middle, rather like a snaffle bit. Most of the military bits from the 18th-20th Centuries relied on a solid bar for the port, though the were, and are, available on the civil market. The chains across the lower end of the bit are pretty interesting, as they are totally absent from more modern, i.e. 18th Century and later bits. 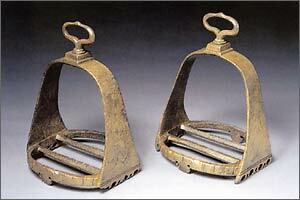 A curb chain (not shown) of course would be fixed under the horse's jaw, but these obviouosly fit inside the mouth. It's probably to give him both something to play with with his tongue, as well as keep the bit from being tossed out of his mouth in an awkward situation. The stirrups were also noted by Markham. He refers to the top set as the proper, perfect style with the rounded sidebars and broad foot piece, while the second set, with the straight bars coming down, he thought was dangerous to the user and could result in a foot caught in the stirrup in the event of a fall. I see both styles used contemporaneouosly for centuries though. Another interesting thing is that the earlier stirrups all seem to have a guard in front of the stirrup-leather loop, while the second, somewhat later stirrups show no such guard. Markham shows guards on his illustrated stirrups, so I'm not sure when the fashion changed, but it's interesting to note the fact that it did. Thanks again, Nathan, this stuff is great!